Fleece products are a wonder of modern technology. Created first in 1979 by Maldan Mills and branded as Polarfleece, polyester fleece is a light weight synthetic fabric that keeps you warm and dry. 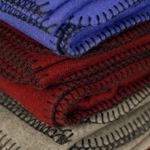 Polyester fleece blankets are usually made with recycled plastic soda bottles. 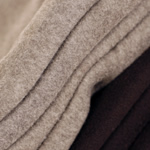 Synthetic fleece is much lighter than traditional woolen fleece fabrics allowing greater breathability and comfort. 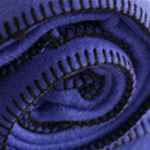 All of these features make polyester fleece blankets very environmentally friendly to landfills and cute little sheep! 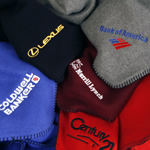 Polyester Fleece fabric is hydrophobic and very breathable. Hydrophobic is a scary sounding word that just means that the fleece does not like water. This keeps you warm and dry whether you're in the great outdoors or at home.